I have updated all results from shows to results page. I started to write all results from beginning this year. It tells more than just the best results from dogs successing. And it is always so wonderful to see dogs bred by me - I'm proud of them all. Results or not. Enjoy the great results! My dear friend Virve visited here some weeks ago with her dogs Sissi and Hulda. We took all our dogs to a biggest dog swimming pool. It was so fun, although Martta didn't first like it. But she swim very good. Maia loves to swim, so she had only fun while we were there. Also Sissi and Hulda swim well. Also Haru had started to swim after her maternity leave. She also has started blood tracking - and she is really good in that! Haru's sister Hulda has been at agility quite a long time for now, so maybe we'll hear some competition results some day from tracking and agility?! We don't yet have snow, but the winter is coming. So nice autumn to everyone! And if you are looking a big, red Akita male, remember Hercules who is looking a good and loving home. I haven't been up to date with these english sites. Sorry for that! So much has happened since spring, so quite of a novel coming..
Let's start with puppy news. I flew with Haru to Czech to meet Ryuu.. And now we have three gorgeous, strong puppies here! The Cheko-litter was born at July 24th, 2013. I can't thank you enough Jitka and Ralf!!! I'm so gratefull for these puppies. These trips to abroad are never easy, anything can happen. So I'm so happy that we got these puppies. Haru is a perfect mother, she is taking good care of her dear ones. Also our import boys Riki and Marski had brides from abroad. Riki's puppies was born to Russia to Irina's dear Polyushka Tomimopa at kennel Yuki Tenshi, and Marski's to Sweden, kennel Isamashii's. Big congratulations Irina and Josefine!! Also Tamatora is father again. He and red Akita girl Saiko got two puppies. Congratulations to Turo & Co. and P�ivi & Harri! Shows has been extremely great this summer..! There are now new VU dogs with CACs and the most wonderful results are from Sissi's boys Reetu and Inuki who both was placed at group finals!! Reetu was BOG-2 at Mikkeli (Finland) and Inuki BOG-5 at Lithuania. I'm SO HAPPY for these amazing results!! Reetu is only a junior. Imagine what he can achieve later. Also Hulda got her final CAC so she is now a Finnish Champion. Congratulations dear Virve and Niko!! Summer has been hot. I have owned dogs for 15 years now and this summer was the first time I had to put my dogs in a kennel because I was out of town. Martta, who has SA, reacted strongly and now I'm taking care of her. Her skin is in a really bad condition, but there has been great improvements since she returned home and I started to feed her again with raw food and vitamins. I also just took her to see a homeopath and now I'm treating her and waiting to see what happens. This year was the first time we had some problems with Maia. She LOVES to swim and when we are at cabbin she can swim all the time. This year she was all crazy in the water that she fell few times at the wet and slippery rocks. 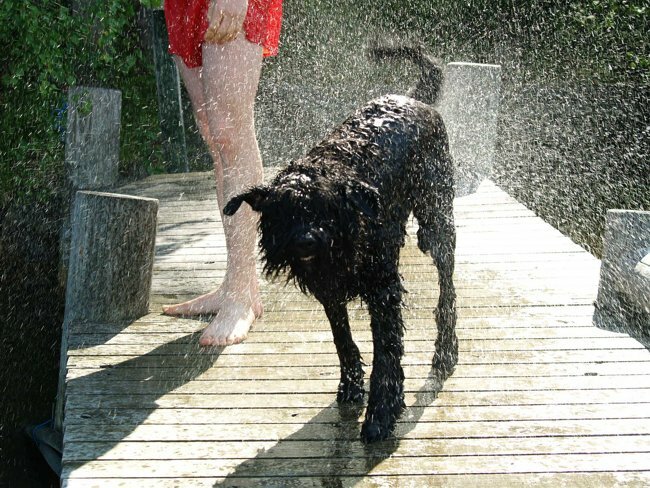 And that caused to her "wet tail". She couldn't move her tail at all, because of the pain. We were so worried. Then I gave her one pain killer medicine (Ketorin) and she was better. At next day I gave her another pill and the the tail was normal again. Maia has been swimming after that also with no problems. There have also been losses. At summer we have lost two boys and one girl. Musashi gave up after two years of battling with UDS (VKH). I'm so sorry for this much loved boy! We have lost also very young Hamu who started to act too aggressive and unpredictable towards human. So I decided it's best to put him to a sleep. And then there is Sakura whos SA symptoms were too bad and dear Sakura was forset to put asleep. I'm so sorry for the losses of the dear ones! Sissi and her daughter Hulda visited Taisto-Sulevi and Otso. Taisto-Sulevi is alive wild boar and Otso is a bear (machine)! It was really great to see how the dogs act when they meet wild animals. Taisto-Sulevi was in a park, other side than the dogs (a fence between them). The dogs were interested about the Taisto-Sulevi, but nothing more. They just smelled him on the otherside of the fence. After this the dogs was taken into a forrest and the bear machine - with real bear skin on him - started to move closer to the dogs. It was a big surprise how Sissi acted! Sissi really thought it was a real bear and she tried to keep her owner away from the threat by turning agains to bear with barking. It was amazing to watch! Hulda didn't think too much of the bear, she reacted by much less than her mother. Thank you Virve and Niko for taking the girls to see the animals! 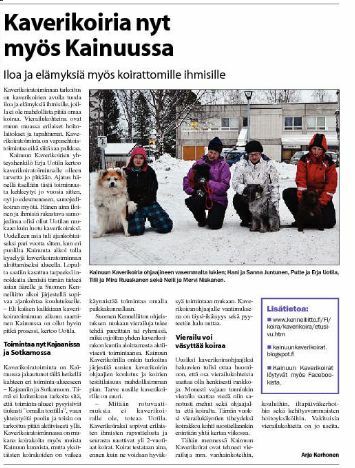 Hoku was pictured to a dog magazine in Finland. This magazine called Reviiri was writing a column about swimming pools for dogs and Hoku got to be a model student for the paper. Well done Hoku! Topi has a new onwer, Noora at kennel Vuorenvarman. Good luck Noora with Topi, I hope that he will produce healthy and big offspring like he is! Valo, Umare litters boy, is growing fast. He is a big boy and very soon he will move to his new home. I'm so happy to say he moves into a great home where is already two females - one of them is Akita. Valo is a result of a great journey to Czeck. And he is now 5th generation of Viribus Unitis dogs. This is something I'm very proud of. I'm also very happy that Hulda gave birth on her own, because it's not always easy labors with small litter. Siru is becomming a quite of a celebrity! Siru has been in a local newspaper because of her voluntary job; official "Friend dog" (Kaverikoira). Friend dogs visits nursing homes etc. and now Siru is also a "reading dog". Because of her two "jobs" Siru has been now twice in a local newspaper and in a radio also. Siru didn't talk too much, her owner did ;) All the things Akitas can do..! I'm so proud of this soul savior! I have updated lots of pictures about dogs bred by me and I must say, I'm really proud of the result! I really love every one of them! We are meeting at the end of summer so I can spend time with many of them. I'm really looking forward to that weekend. Hoku is the first VU-akita who has met mashine bear Pena. Hoku didn't choke, didn't attack the mashine bear and didn't freeze. So it went well. Smart dog. Marski went abroad at 9.3.2013 and the result of that he came back with new champion title; Sweden Champion and he will finish his international championship title (CIB) also! BOS and BOB Akitas. Congratulations Timo and Co.!! Congratulations also Josefine for Jackies BOB! Speaking of shows, I added the old sites show results from year 2001 to 2009. At least I got nostalgic feeling from the beautiful old sites. UDS (aka VKH) is the worst disease Akitas have. And everytime someone in Finland gets it, it looks like the dog can survive about 6 months and then the disease takes control and the dog has to put to asleep. So I'm a bit confused about Musashi who was diagnosed about 1,5 years ago with UDS and he is still alive! I'm not sure what to believe, but I'm not so sure about the UDS anymore. Anyway, many good days with Musashi! My super great victory road still keeps on going. 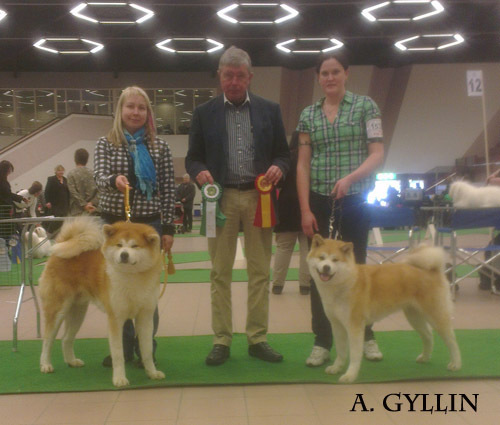 At years 2008 to 2011 Viribus Unitis has been finnish Akita Club's most winning kennel. I among many other finnish Akita breeders left that club and we are now under a new club which is called Finnish Nihonken Club, and I was agan rewarded the most winning Akita kennel in Finland for 2012! Fift year in a row - wow I must say!! VU Akitas are great, I know that, and many judges agrees with me. Congratulations to us, the VU team! Hilma is a wonderful guard dog - this is nothing new. But now she has proved herself to all of us. Hilma take care of robbery by running down the robberies and bringing them back with everything they took!! Truly amazing! Way to go Hilma! Inuki is still going strong. Now he conquered Norway! Inuki got CACIB + CAC from Norway and is now Champion of Norway also! Congratulations again!! We took a trip to Czeck to visit Ryuu with Hulda. The trip was amazing. Thank you Jitka and Ralf so much for all!!! Puppies are coming at week 12, so the trip was succesfull. Hugs and kisses to the wonderful boys Ryuu and Daimon - both are really lovely boys! The begining of the year 2013 is wonderful and full of great things! Inuki entered his 3rd show and got his 3rd CAC + CACIB and is now Finnish Champion!! Wonderfull male I might say.. Congratulations Kevin & Co for Inuki's amazing success! Also the little sweet princess Aiko showed her best and charmed another judge. Aiko was BOB veteran and 2nd best female at Helsinki Winner show at December 2012. Huge congratulations to Niina - again!! I'm so proud of Aiko and Inuki. I also have very interesting puppy news. We took a trip to Czech to meet a wonderful Ryuu Akai and his dear sire Daimon. Thank you Jitka & Ralf very much for letting us use your special boy to our dear Hulda. We were having so much fun!! Now we just hope that everything goes well and we'll have a beautiful, dark red litter at spring. I added a list of Akita boys whos are available for breeding. The list is here - check it out! Litter H made a suprise; there are 3 long-haired puppies! They are just so cute - so fuzzy and wonderful. Thank you Maria and family for you hard work with puppies! Hani from litter E got herself in a local newspaper. Hani is an official "friend dog" in Finland! Hani is in the left in the picture. Hani's owner Sanna is doing a great and valuable job with her. I got some bad news about Sakura, she has SA. I hope she is like her mother on this, because Martta has lived well with her disease. Then I want to say that I'm a member in a new Finnish Nihonken club (SuNi). It is a new club in Finland and an organisation to the Japanese breeds (Akita, Shiba, Hokkaido, Kai and Kishu). Pages can be found in here: http://www.nihonken.fi/index2.html Sorry, only in finnish. Our annual weekend at Aurantola was held with lovely company last autumn. Thank you all my friends who were there! You can find some pictures, taken by Niina Tielinen, here: picasa gallery. Then something about me. I love taking photos, especially from dogs. So I send few of my photos to a competition by Warkaus newspaper and Maia's picture placed in shared third. The picture is called 'Smile'. Thank you Teija for telling me about the competition!